New Delhi : (07/02/2019) India is one of the most populated countries in the world which is why there are also ample issues related to the medical problems. 22% of Indian population is below poverty line and are unable to arrange big amounts when needed to get them or their family cured from any severe medical issue. Government hospitals in India have thousands of patients waiting to get admitted and cured from the medical issues they are facing. 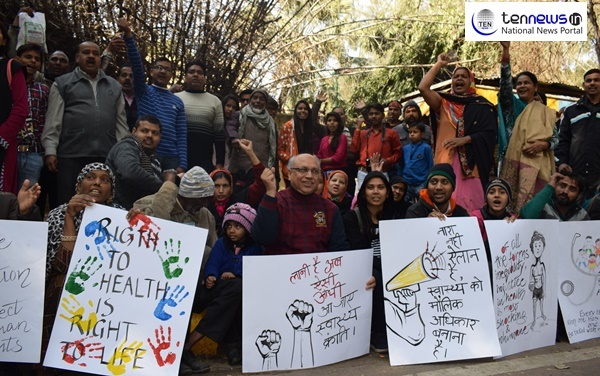 Today, Advocate Ashok Agarwal along with dozens of people who are facing one or another issues because of inadequate and expensive medical facilities demanded for course correction in this domain. These people demanded that Right to Public Health should be given the position in the list of Fundamental Rights in India. Sharing their bad experiences with medical facilities, people reacted to the current situation of medical facilities for middle class people in India.